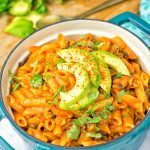 This Vegetarian Fajita Pasta is an amazing entirely vegan and gluten free Mexican inspired dish. Made with a creamy and spicy Enchilada sauce, and full of fresh vegetables. Comfort food that you can easily customize to your taste. Start with frying the garlic with your favorite oil. If you want to go for oil free cooking, simply use vegetable broth. If you decide to use the chopped onions now is the time to add them. Together, it will take 4 minutes until all is slightly golden and brown. You will recognize a delicious smell in your kitchen. Next and last add all the other ingredients (Enchilada sauce, Taco seasoning, bell pepper and your optional choices) to that pot. After 5 minutes add the cooked pasta and cook for 4 minutes more. Divide into bowls or plates, and serve with avocado slices on top.